Variety of client like Desktop Browser, Mobile Browser and Native Mobile Applications. Exposing APIs for 3rd parties to consume. 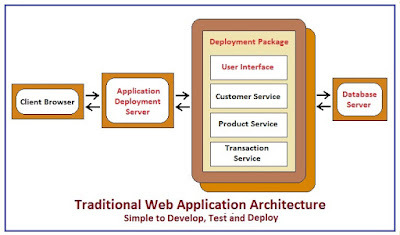 It might also be able to integrate to other application via web services. Application handles HTTP request and messages by executing business logic, accessing database exchanging data with other system and returning a HTML/XML/JSON response. Application integration logic - messaging layer, e.g. based on Spring integration. 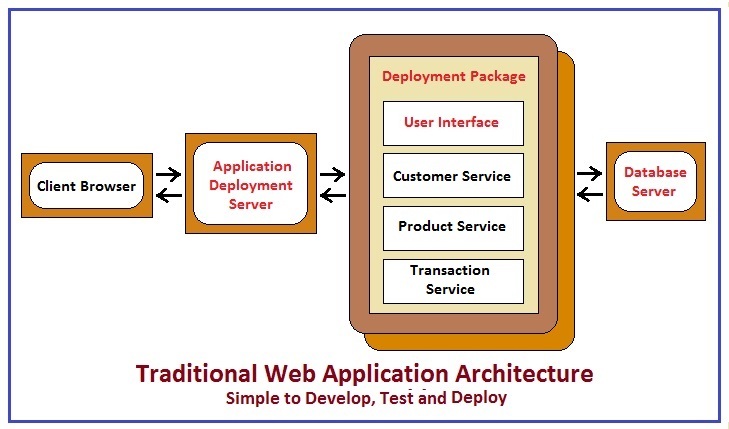 We have two kind of architecture to manage applications. The application can be difficult to understand and modify resulting development goes slows down. Larger the code base will slow down the IDE resulting the less productive developers. Overloaded web container, longer it takes to respond. Continuous deployment is difficult because a minor update in any component resulting re-deploy whole application. Scaling the application in terms of transaction volume is bit easy by running same code on multiple servers but scale with an increasing data volume is too difficult because all app instance will be accessing the same database. Scaling the application in terms of development is also difficult, even if we divide team with their responsibilities. Because it prevent teams working independently, teams have to coordinate their development effort to each other. The microservices architecture is an alternative pattern that addresses the limitations of the monolithic architecture. X-axis scaling – consists of running multiple copies of an application behind a load balancer. 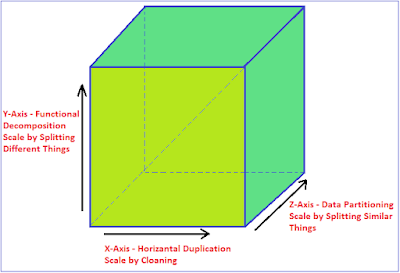 Y-axis scaling – splits the application into multiple, different services. Each service is responsible for one or more closely related functions. There are different ways of decomposing the application into services. Use verb-based decomposition and define services that implement a single use case such as checkout. Use noun-based decomposition and define services responsible for all operations related to a particular entity such as customer management. An application might use a combination of verb-based and noun-based decomposition. Z-axis scaling – splits are commonly used to scale databases. Data is partitioned across some servers. Like primary key of the table is used to partition the rows between two different database servers. Z-axis scaling improves fault isolation since a failure only makes part of the data in accessible. Each service can be deployed independently of other services and easier to deploy new versions of services frequently also. Easier to scale development. Suppose there are multiple team working on different services then each team can develop, deploy and scale their service independently of all of the other teams. Improved fault isolation. If there is a memory leak in one service then only that service will be affected. The other services will continue to handle requests. Eliminates any long-term commitment to a technology stack. Because for new service we are free to be upgrade technology. Developers must deal with some complexities of creating a distributed system. Increased memory consumption. 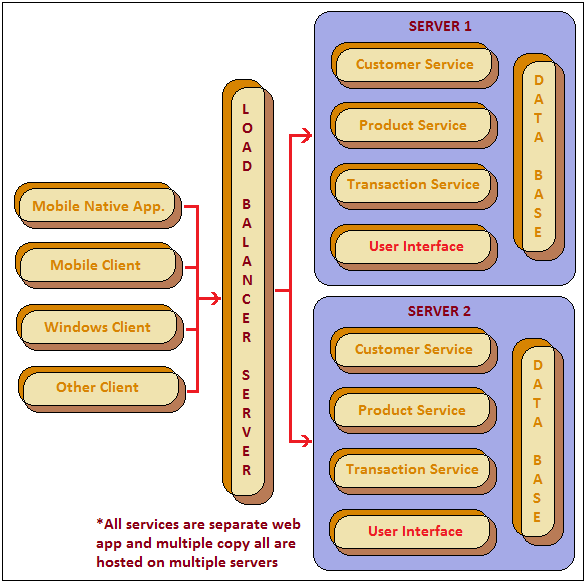 The microservices architecture replaces N monolithic application instances with NxM services instances.